Learjet has a rich and vibrant history. The company was founded in 1962 by William Lear, a groundbreaking engineer and developer responsible for more than 150 patents in radio and technology. He used his fortune to create a new line of business jets, which at that point, were typically repurposed from old cargo planes. Taking inspiration from a Swiss military jet, the Learjet 23 was developed as the first model, taking flight in October 1963 from the company's home base in Wichita, Kansas. It was a groundbreaking aircraft with a wraparound windshield, swivel-position passenger seats and an outward-opening clamshell door — all unique features still seen today in the latest Learjet models. The second Learjet produced was donated to the Smithsonian National Air and Space Museum in 1978, where it remains on display to this day. As new models were developed over the years, Learjet would go on to set a number of speed and travel records. Company ownership changed hands multiple times, eventually settling under the control of Canada-based Bombardier. Among the most impressive and popular models is the Learjet 60. The mid-size cabin can comfortably hold up to seven passengers and two crew members with plenty of space for luggage, including oversize items like golf clubs and ski equipment. The Learjet 60 was developed in the early 90s and is known for its fast climb, reaching 41,000 feet in less than 19 minutes at maximum weight. 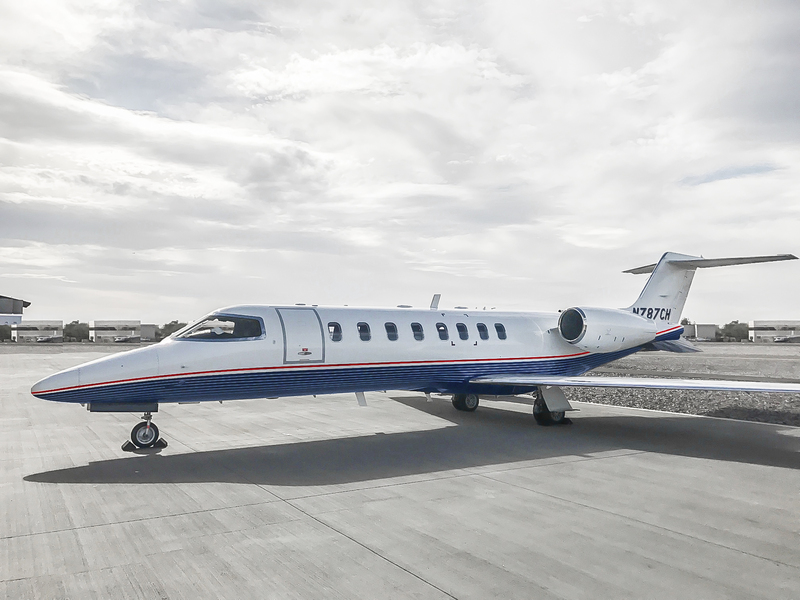 Cirrus Aviation Services currently has three Learjet 60 aircraft in its fleet. With a 2,500 nautical mile transcontinental range, the jet is a fantastic choice for flying across the country and to Canada, Mexico or the Caribbean. Cirrus Aviation also has two Learjet 45XR aircraft in its fleet. The model is an upgraded version of the Learjet 45, which was the first "clean sheet" design under the brand. Until its development in the 90s, all of the company's jets could be traced back to the original Learjet 23. The Learjet 45 is a super-light jet with performance and comfort comparable to a midsize jet. The 45XR is well-suited for destinations with shorter runways and high altitudes, making it a great choice for ski vacations in Aspen or South Lake Tahoe. Contact Cirrus Aviation at 702-472-9714 to book a Learjet 60 or Learjet 45XR today. Cirrus Aviation also has access to other Learjet models from a valued network of trusted partners. Whether for business or pleasure, a Learjet aircraft is an enticing choice for traveling to and from the world's most in-demand destinations.